What Do “Faith” and “Believe” Mean in the Bible? The ordinary definitions of “faith” and “believe” imply intellectual agreement with an idea or accepting something as truth, but pistis means more than that. As used in the Bible, it also implies trust in and reliance on God or Christ, surrender of our wills to God or Christ, and conduct consistent with that surrender1. All those elements are present in any mention of “faith” or “believe” in the New Testament, but from the context we can often see that some of the elements are emphasized. In the New Testament, the words “faith” and “believe” often imply confidence, trust, reliance and humility with respect to God or Christ. That is the case with Jesus’ healings. In the story below, the woman had confidence that she would be healed if she could merely touch Jesus’ clothing. She put her trust in Jesus and relied on Him, because all worldly attempts to cure her had failed. She approached Jesus with utmost humility – in fear and trembling. Jesus’ power healed her, but her faith enabled that healing. The story of the woman with a hemorrhage also has a lesson. If we approach God with humility and put our confidence and trust in Him instead of in worldly things, our faith will enable our spiritual healing and salvation. 14 And just as Moses lifted up the serpent in the wilderness, so must the Son of Man be lifted up, 15 that whoever believes in him may have eternal life. 17 “Indeed, God did not send the Son into the world to condemn the world, but in order that the world might be saved through him. 18 Those who believe in him are not condemned; but those who do not believe are condemned already, because they have not believed in the name of the only Son of God. 19 And this is the judgment, that the light has come into the world, and people loved darkness rather than light because their deeds were evil. 20 For all who do evil hate the light and do not come to the light, so that their deeds may not be exposed. Verses 14-16: We can trust in Christ and rely on Him for salvation just as the Israelites trusted in Moses and relied on him while wandering in the desert. The image of a serpent that Moses lifted up on a pole was the cure for the snake bites suffered by the Israelites (Numbers 21:4-9). Similarly, Jesus was lifted up on the cross and then “lifted up” into His glory for the salvation of sinful mankind. That salvation is now available to the whole world, not just Israel. Verses 17-18: We must put our trust and confidence in Christ as the way to salvation. By implication, our wealth, earthly power, intelligence, popularity, good deeds or obedience to rules and laws cannot save us from being condemned to hell. Verses 19-20: People who do evil deeds have not come into the “light” of Christ – they are not true believers and do not have true faith. A thief works by night to avoid being seen in the light of day. Similarly, many people prefer their sinful ways and avoid facing the “light” of Jesus’ teachings about love, greed, morality, arrogance, etc. (Matthew 5:43-45, Mark 7:21-23, 12:28-31). Verse 21: Although we are not saved by doing good deeds, good deeds and holy living will show clearly in the lives of those who do have saving faith. The apostle Paul was not one of Jesus’ original followers or disciples. In fact, he despised the growing Christian movement and fiercely persecuted the early Christians. Then, several years after Jesus was crucified, raised and ascended to heaven, Paul had a dramatic encounter with Jesus on the road to Damascus (Acts 9:1-9). After that, he spent time learning from some of Jesus’ disciples and became the most energetic disciple of all. He founded many Christian communities among the Gentiles (non-Jews), and his letters to these communities are among the earliest Christian documents preserved in the New Testament. A group of people known as Judaizers opposed Paul’s ministry to the Gentiles. They told the Gentile converts to Christianity that they must observe all of the Jewish Law – circumcision, dietary restrictions, and all the many other rules and laws. But Paul said that was wrong; salvation comes through faith in Jesus Christ, not by observing the Jewish Law. Church officials of the Middle Ages had fallen into the corrupt practice of selling indulgences to raise money. In return for the “good works” of a monetary contribution to the Church, it was often implied that people could virtually guarantee their entry into heaven, or even purchase release from the pains of purgatory for a deceased relative. Martin Luther (1483-1546), was a Catholic monk and Professor of Scripture at the University of Wittenberg in Germany. From his study of Scripture, Luther knew that the “good works” of giving money to the Church did not have the power to forgive people’s sins. Instead, Luther taught that we can be justified (made acceptable to God) only by faith. But Luther did not deny the importance of other good works such as obeying God’s commandments, helping other people, etc. He wrote, “For grace and faith are infused apart from our work, and when they are infused, then the works follow.” In other words, when one is saved by the grace of God, through faith, he or she will practice good works as a result of that transformation. He also taught that a believer must practice repentance throughout his or her whole life. In 1517, Luther tacked his famous 95 theses entitled “On the Power of Indulgences” to the door of the castle church at Wittenberg. That document was a scathing indictment of the practice of selling indulgences, and it set off the chain of events that led to the Protestant Reformation. However, the Catholic Church soon undertook its own reforms and the practice of selling indulgences was abolished. It is a great comfort to know we do not have to be perfect to find God’s favor. Even the worst of sinners can become a new creation in Christ (2 Corinthians 5:17) through faith. Then, through good works and repentance, the light of Christ will shine brightly in our lives (Matthew 5:16, Luke 15:7). The Bible takes it for granted that God exists, and it does not attempt to prove it. There is no proof of our faith that we can see or touch, and there is no evidence that will convince someone who does not want to believe. Knowledge of the physical world is based on things we can observe with our senses and analyze with mathematics and logic. But knowledge of God and Christ is a different kind of knowledge based on faith. Some people see evidence of God in the life and teachings of Jesus. Some see evidence of God’s creation in the intricacies and wonders of the universe and life. Some may perceive God in the gift of life and the miracle of birth. Some see evidence of God in the beauty of the world. Some see God in unselfish love (1 John 4:7-8). Other people see the sometimes hypocritical and cynical actions of Christians and religious leaders as a reason not to believe. However, the failures of some Christians does not disprove the existence and goodness of God. Some people see the evils of war, crime, prejudice, greed and poverty and the tragedies of natural disasters and death as reasons to reject God. But others see the gift of life, the gift of unselfish love, the opportunity to serve others and the promise of a glorious eternal life as reasons for faith, hope and optimism. A conscious decision and a “leap of faith” are required to put our hopes and trust in God instead of in worldly things. But those who sincerely take that leap often develop a sense of peace, security and joy that confirms the correctness of the decision. The person afraid to get in the water will never learn to swim. Similarly, the person afraid to believe without knowing all the answers will never find faith. During the time of the prophecy of Isaiah, as most Christians know, Babylon deported Israel to a far away land. Of course, scholars tell us that at most those whom the Babylonians deported numbered no more than 10% of the population. Nonetheless, the Babylonians plainly knew what they were doing. The persons that they deported from Israel were those who were most instrumental in administrating Hebrew society — the priests, the wealthy, and the most educated of Israel’s leadership. This “strategic deportation” effectively crippled customary Israelite life during the years of deportation. The days of the exile were difficult for Israel. The deportation into exile changed everything for those exiled, as well as those who remained behind in the sacred land of Canaan. We can get a sense of the misery of those in exile when we recall the plaintive cry of those cut off from the temple and other familiar fixtures of worship in their homeland: “By the rivers of Babylon — there we sat down and there we wept when we remembered Zion” (Psalm 137:1). This prayer reveals the deepest and most profound experience of homesickness — feeling cut off from even God! Conceivably one of the reasons that the lectionary constructors selected our lesson today from Isaiah is that it speaks to the hope of all people for “Homecoming.” Many people in our modern society feel detached from life. Work has become increasingly ruthless with demands on companies and small businesses to increase profits. This circumstance forces workers into longer and more stressful labor. In families, economic pressures increase stress on relationships. Children are unsupervised with the advent of both parents, if they are still together, working harder and longer hours. Urban traffic virtually guarantees fretful or short-tempered parents when they finally do arrive home to the family. Our sense of home seems distant from earlier American scenes depicted by the artist Norman Rockwell or the nostalgic Currier and Ives commercials of days gone by. For these reasons and many more, most of us yearn for simpler times. When we remember our own childhood, it seems that times were better and more secure. Consequently, we relish the evocative days that Christmas represents. Christmas prods us to recall our best memories and what we all hope for when we consider home. For modern people, Christmas is not merely a religious holy-day, which it certainly is, but it also signifies the in-gathering of family and homecoming. Home is a notion valued in the Bible. Possibly for the Hebrew people the idea of home was especially precious. From the beginning, God had led them toward it. We all remember how God’s relationship with the covenant people began: “Now the Lord said to Abram, ‘Go from your country and your kindred and your father’s house to the land that I will show you’ ” (Genesis 12:1). Later, after Jacob had served many years under the discipline of his father in law Laban, Genesis 30:25 tells us, “When Rachel had borne Joseph, Jacob said to Laban, ‘Send me away, that I may go to my own home and country.’ ” Even the wisdom literature reminds us that “Like a bird that strays from its nest/is one who strays from home” (Proverbs 27:8). Home and the idea of homecoming is in our spiritual DNA. For people like the exiles and for people like us modern and sophisticated folks, homecoming nearly always conjures images of hope. It is likely that some in Israel, however, said that Isaiah’s image of a homeward journey was naively optimistic. Isaiah wrote that Israel would travel homeward on “A highway . . . and it shall be called the Holy Way” (35:8). Faith in God gives us a positive option by which to react to the things that life throws our way. Genuine homecoming is to be re-united with the Lord. Our faith keeps this option open to us. The other option is despair which lead to death. Faith places this decision within our grasp and Christmas helps us focus on what authentic homecoming is all about. Later another salesman went to the same area. He too immediately sent word to the home office. But his telegram read, “Great potential! People don’t wear shoes here!” A person’s perspective depends on a person’s faith. For the Hebrew people and Christians Isaiah reminds each of us about that largely untapped resource we call faith. By faith we can get home! Why are so many strong Christians succumbing to sexual sin? We must remember that we as Christians do not live in a vacuum but in a culture filled with temptations that stir lust. Many people have fallen because they underestimated the power of sexual temptation. Paul’s first letter to the Church at Corinth has the strongest teaching about sexual sin because Corinth, like our culture, was saturated with sexual temptation. The Bible declares that God is faithful and no matter what temptation we face, He will provide “a way out so that you can stand up under it” (1 Cor. 10:13). As the wisdom of Proverbs says, pride sets us up for a fall. All sorts of ways, I suppose; but I know there’s one way he wouldn’t get me. “What’s that?” He’d never get me in the area of my personal relationships. That’s one place where I have no doubt that I’m as strong as you can get. A few years after that conversation my world broke wide open. A chain of seemingly innocent choices became destructive, and it was my fault. Choice by choice by choice, each easier to make, each becoming gradually darker. And then my world broke — in the very area I had predicted I was safe — and my world had to be rebuilt. He goes on to quote from My Utmost for His Highest: “An unguarded strength is actually a double weakness.” Here is a man of God with a good marriage who had written books on family life and yet fell into adultery. Why? Because he thought it couldn’t happen to him and left this part of his life unguarded. If David, who was “a man after God’s own heart,” Gordon MacDonald, and many other strong men and women of faith yielded to sexual temptation, it could happen to you. God is telling us through these words of Paul — “So, if you think you are standing firm, be careful that you don’t fall!” (1 Cor. 10:12) — that our vulnerability to sin increases when we think it could not happen to us. Almost all Christians, especially Christian leaders, who have fallen to sexual temptation would tell you that they did not think it could have happened to them. 1 Corinthians 6:18 warns us, “Flee from sexual immorality.” It is easy for pride to convince us that we don’t really need to FLEE, and that this instruction is for weaker Christians. We mislead ourselves into thinking that instead of fleeing we can stroll away, looking back once in awhile, because we are strong enough to resist or flirt with temptation. Admitting that we need to flee takes real Christian humility. Remember, overcoming sexual temptation will cost your pride dearly. When do you need to flee? When you find yourself thinking about a “friend, co-worker, ministry partner, counselee” and how much you enjoy being with this person — FLEE! When you look forward to spending more time with this person and you make sure you look especially nice if you know you might see your “friend” that day — FLEE! If you begin to fantasize about being with this person or knowingly start touching your “friend” in “innocent “ ways — FLEE! When you become more secretive about your interaction with your “friend” because people like your spouse might “misunderstand” your friendship — FLEE! If you receive cards, e-mails or presents from this person that you would not want your spouse to see — FLEE! When you find yourself comparing your spouse in an unfavorable way to your “friend”– FLEE! If you start confiding in your “friend” about your marital problems — FLEE! Anytime we feel we must keep something secret, this would indicate that sin is crouching at our door. If you are experiencing sexual attraction to someone – or experiencing some other kind of temptation over a few days – go to your spouse or someone you can trust in the Body of Christ. Bring the secret out into the light of day and ask for prayer and accountability. Satan loves it when we keep secrets in the dark because of shame, fear, or pride – but remember, darkness is overcome by light. Often this alone can break the power of temptation, but it will cost you your pride. If you’re losing the battle against a persistent bad habit, an addiction, or a temptation, and you’re stuck in a repeating cycle of good intention-failure-guilt, you will not get better on your own. You need the help of other people. Some temptations are only overcome with the help of a partner who prays for you, encourages you, and holds you accountable. Tragically, too many people – because of family background, having experienced sexual abuse or abandonment, or having a long history of struggling with lust – need significant ministry, yet are unwilling to get help until they are forced to do so after yielding to sin. Yes, there is a price that your pride must pay to overcome temptation – but please take a moment and consider the much greater price of yielding to temptation. Consider the damage to the cause of Christ, to your family, and to your Christian witness, along with the pain you will cause yourself and the ones you love the most. God has given us everything we need to overcome temptation, but it will cost our pride dearly. However, I plead with you to consider the even greater cost of yielding to the temptation. Human beings are naturally inclined towards sin. Everyone feels the urge to sin at some point because sinning gives us tangible yet fleeting benefits at the cost of moral and spiritual ones. Temptation is the urge to sin. We’re judged by the degree to which we thwart our temptations. Because of humanity’s sinful nature, everyone, at some point, fails to resist their temptations. Luckily, we’re never alone in our quest to thwart our temptations. In the words of the Bible: “No temptation has overtaken you that is not common to man.” (1 Corinthians 10:13 English Standard Version) In this guide, you’ll learn strategies for avoiding temptation and for combating it when it does find you. STEP 1–Identify your temptations and the personal flaws that create them. Everyone has their own temptations. Though Jesus never sinned, even he was tempted to. (Hebrews 4:15) Spend a few moments self-reflecting to identify your personal temptations. Then, pin down the personality traits that lead you to temptation – maybe you’re insecure or you’re never satisfied with yourself. Perhaps you prioritize pleasure over responsibility. No two people are exactly alike. Your temptations might resemble those of your friends, family, or other associates, but there’s also a chance that they’re unique to you. A priest, counselor, or other trusted person can help you discover your unique temptations and the flaws from which these temptations developed.If you’re having a hard time defining exactly what your temptations are, begin by pinpointing the things in your life that make you sad, then try to find a thought process or habit you possess that leads to these things. For instance, let’s say you’re in a committed relationship with a woman you love but you frequently feel intense guilt because you flirt with other women. Search your heart. Ask yourself, “what do I think or do that makes me want to act like this?” After some reflection, you may find, for instance, that you’re worried about whether you’re still attractive. The source of your temptation in this case is your sense of insecurity. STEP 2—Set reasonable goals for fighting temptation. Your aim when fighting temptation should take into account the fact that, as a human being, you’re incapable of perfection. Don’t set an un-achievable goal like “I will never sin again.” If you do, you’re setting yourself up for disappointment. Realize that you will inevitably sin again (and again and again). Set a realistic goal that takes this into account.For instance, if you’ve been neglecting your child’s vocal recitals in favor of nights spent at home watching TV, you might set a goal of never missing another vocal recital (except for emergencies) and of reducing your time spent watching TV every week by four hours. This goal is well within your grasp. For a few very serious sins, it is absolutely necessary to set a zero-tolerance goal – for instance, you should obviously never commit murder or marital infidelity. These sins can cause irreparable damage to others’ lives. STEP 3—Take responsibility for yourself. You were blessed with free will for a reason. Don’t waste your opportunity to act decisively against your personal temptation by giving into the separate temptation of inaction! Stand up and take action now. Make it your goal going forward to not give in to your temptation. The hardest part of overcoming your temptation can be getting started. Don’t sabotage your journey before it’s begun by telling yourself you can’t do it.When Jesus died, he gave us authority over the forces of evil. (Mark 16:17) Never fear or run from the forces of evil in your own life. With hard work and sincere faith, nothing is beyond your grasp. Why Does God Allow Tragedy and Suffering? The Answer. The following message was delivered on July 22 by Christian author and apologist Lee Strobel, just days after the deadly theater shooting in Aurora, Colorado. Lee has graciously given us permission to post it here on Lights Burning . That “why” question goes back thousands of years. It was asked in the Old Testament by Job and the writers of the Psalms, and it was especially relevant during the 20th century, where we witnessed two World Wars, the Holocaust, genocides in the Soviet Union and China, devastating famines in Africa, the killing fields of Cambodia, the emergence of AIDS, the genocide in Rwanda and the ethnic cleansing of Kosovo. And the 21st Century didn’t start any better. There was 9/11 and now the Syrian slaughters, and on and on. Why all of this if there’s a loving and powerful God? Why do bad things happen to good people? Several years ago, I commissioned a national survey and asked people what question they’d ask if they could only ask God one thing. The Number One response was: “Why is there suffering in the world?” Incidentally, I did find an interesting statistical quirk – people who are married were much more likely to want to know why there’s so much suffering. I’m just sayin’. But if you’ve never asked why our world is infected with pain and suffering, you will when they strike you with full force or they come to a loved one. And Jesus said they are coming. Unlike some other religious leaders who wrote off pain and suffering as just being illusions, Jesus was honest. He told us the truth. He said inJohn 16:33, “You will have suffering in this world.” He didn’t say you might – he said it is going to happen. So when you ask about specific individual events and want to know why this particular thing happened, we won’t get the full answer in this world. Someday we’ll see with clarity, but for now things are foggy. We can’t understand everything from our finite perspective. And frankly, the people suffering from the Aurora tragedy don’t need a big theological treatise right now; any intellectual response is going to seem trite and inadequate. What they desperately need now is the very real and comforting presence of Jesus Christ in their lives. And I’m so grateful that so many churches and ministries of this community are helping them experience that. But for us, let’s focus on the big, overarching issue of why God generally allows suffering in our lives – your life and mine. Friends, this is important: even though we can’t understand everything about it, we can understand some things. Let me give you an analogy. Once Leslie and I were driving from Chicago to Door County, Wisconsin, which is that thumb-shaped peninsula that juts into Lake Michigan. We were driving up the highway in the dark, when it started raining heavily and we hit dense fog. I could barely see the white stripe on the edge of the road. I couldn’t stop because I was afraid someone might come along and rear-end us. It was frightening! But then a truck appeared in front of us and we could clearly see his taillights through the fog. He apparently had fog lamps in front, because he was traveling at a confident and deliberate pace, and I knew if we could just follow those taillights, we’d be headed in the right direction. And the same is true in understanding why there is tragedy and suffering in our lives and in our world. We may not be able to make out all the peripheral details of why — they may be obscured from our view — but there are some key Biblical truths that can illuminate some points of light for us. And if we follow those lights, they will lead us in the right direction, toward some conclusions that I believe can help satisfy our hearts and souls. What are those points of light? Let me go through five of them that I’ve personally found helpful whenever I’ve been prompted to ask the question, “Why?” The first point of light: God is not the creator of evil and suffering. But if God is not the author of tragedy or evil or death, where did they come from? Well, God has existed from eternity past as the Father, Son and Spirit, together in a relationship of perfect love. So love is the highest value in the universe. And when God decided to create human beings, he wanted us to experience love. But to give us the ability to love, God had to give us free will to decide whether to love or not to love. Why? Because love always involves a choice. If we were programmed to say, “I love you,” it wouldn’t really be love. When my daughter was little, she had a doll with a string in the back, and when you pulled it the doll said, “I love you.” Did that doll love my daughter? Of course not. It was programmed to say those words. To really experience love, that doll would need to have been able to choose to love or not to love. Again – real love always involves a choice. So in order for us to experience love, God bestowed on us free will. But unfortunately, we humans have abused our free will by rejecting God and walking away from Him. And that has resulted in the introduction of two kinds of evil into the world: moral evil and natural evil. The Bible says it’s because of sin that nature was corrupted and “thorns and thistles” entered the world. Romans 8:22 says, “We know that the whole creation has been groaning as in the pains of childbirth right up to the present time.” In other words, nature longs for redemption to come and for things to be set right. That’s the source of disorder and chaos. Let’s make this crystal clear once more: God did not create evil and suffering. Now, it’s true that he did create the potential for evil to enter the world, because that was the only way to create the potential for genuine goodness and love. But it was human beings, in our free will, who brought that potential evil into reality. Some people ask, “Couldn’t God have foreseen all of this?” And no doubt he did. But look at it this way: many of you are parents. Even before you had children, couldn’t you foresee that there was the very real possibility they may suffer disappointment or pain or heartache in life, or that they might even hurt you and walk away from you? Of course — but you still had kids. Why? Because you knew there was also the potential for tremendous joy and deep love and great meaning. Now, the analogy is far from perfect, but think about God. He undoubtedly knew we’d rebel against Him, but He also knew many people would choose to follow Him and have a relationship with Him and spend eternity in heaven with Him — and it was all worth it for that, even though it would cost His own Son great pain and suffering to achieve their redemption. So, first, it helps me to remember, as I ponder the mystery of pain and evil, that God did not create them. The second point of light is this: Though suffering isn’t good, God can use it to accomplish good. Notice that the verse doesn’t say God causes evil and suffering, just that he promises to cause good to emerge. And notice that the verse doesn’t say we all will see immediately or even in this life how God has caused good to emerge from a bad circumstance. Remember, we only see things dimly in this world. And notice that God doesn’t make this promise to everyone. He makes the solemn pledge that he will take the bad circumstances that befall us and cause good to emerge if we’re committed to following Him. The Old Testament gives us a great example in the story of Joseph, who went through terrible suffering, being sold into slavery by his brothers, unfairly accused of a crime and falsely imprisoned. Finally, after a dozen years, he was put in a role of great authority where he could save the lives of his family and many others. This is what he said to his brothers in Genesis 50:20: “You intended to harm me, but God intended it for good to accomplish what is now being done, the saving of many lives.” And if you’re committed to God, He promises that He can and will take whatever pain you’re experiencing and draw something good from it. But if you doubt God’s promise, listen to what a wise man said to me when I was researching my book The Case for Faith: God took the very worst thing that has ever happened in the history of the universe — deicide, or the death of God on the cross — and turned it into the very best thing that has happened in history of universe: the opening up of heaven to all who follow Him. So if God can take the very worst circumstance imaginable and turn it into the very best situation possible, can he not take the negative circumstances of your life and create something good from them? He can and He will. God can use our suffering to draw us to Himself, to mold and sharpen our character, to influence others for Him – He can draw something good from our pain in a myriad of ways…if we trust and follow Him. Now, the third point of light: The day is coming when suffering will cease and God will judge evil. And the Bible says that the story of this world isn’t over yet. It says the day will come when sickness and pain will be eradicated and people will be held accountable for the evil they’ve committed. Justice will be served in a perfect way. That day will come, but not yet. So what’s holding God up? One answer is that some of you may be. He’s actually delaying the consummation of history in anticipation that some of you will still put your trust in Him and spend eternity in heaven. He’s delaying everything out of His love for you. SecondPeter 3:9 says: “The Lord is not slow in keeping His promise, as some understand slowness. He is patient with you, not wanting anyone to perish, but everyone to come to repentance.”To me, that’s evidence of a loving God, that He would care that much for you. Point of Light #4: Our suffering will pale in comparison to what God has in store for his followers. Think of it this way. Let’s say that on the first day of 2012, you had an awful, terrible day. You had an emergency root canal at the dentist and the ran out of pain-killers. You crashed your car and had no insurance. Your stock portfolio took a nosedive. Your spouse got sick. A friend betrayed you. From start to finish, it was like the title of that children’s book: Alexander & the Terrible, Horrible, No Good, Very Bad Day. But then every other day of the year was just incredibly terrific. Your relationship with God is close and real and intimate. A friend wins the lottery and gives you $100 million. You get promoted at work to your dream job. Timemagazine puts your photo on its cover as “The Person of the Year.” You have your first child and he’s healthy and strong. Your marriage is idyllic, your health is fabulous, you have a six-month vacation in Tahiti. And He will. God promises a time when there will be no more crying, no more tears, no more pain and suffering, when we will be reunited with God in perfect harmony, forever. Let the words of First Corinthians 2:9 soak into your soul: “No eye has seen, no ear has heard, no mind has conceived what God has prepared for those who love him.” That’s absolutely breath-taking, isn’t it? Finally, Point of Light #5: We decide whether to turn bitter or turn to God for peace and courage. We’ve all seen examples of how the same suffering that causes one person to turn bitter, to reject God, to become hard and angry and sullen, can cause another person to turn to God, to become more gentle and more loving and more tender, willing to reach out to compassionately help other people who are in pain. Some who lose a child to a drunk driver turn inward in chronic rage and never-ending despair; another turns outward to help others by founding Mothers Against Drunk Drivers. We make the choice to either run away from God or to run to Him. But what happens if we run to Him? In other words, He offers us the two very things we need when we’re hurting: peace to deal with our present and courage to deal with our future. How?Because he has conquered the world! Through His own suffering and death, He has deprived this world of its ultimate power over you. Suffering doesn’t have the last word anymore. Death doesn’t have the last word anymore. God has the last word! So let me finish the story of Leslie and I driving through the fog in Wisconsin. We were following the taillights of that truck when the fog slowly began to lift, the rain began to let up and we entered a town with some lights – things were becoming clearer, we could see better, and as we rounded a curve, silhouetted against the night sky, guess what we saw? We saw the steeple of a church and the cross of Christ. After driving through the confusion of the fog for so long, that image struck me with poignancy I’ll never forget. Because it was through that cross that Jesus conquered the world for us. As that wise man once said to me: God’s ultimate answer to suffering isn’t an explanation; it’s the incarnation. Suffering is a personal problem; it demands a personal response. And God isn’t some distant, detached, and disinterested deity; He entered into our world and personally experienced our pain. Jesus is there in the lowest places of our lives. Are you broken? He was broken, like bread, for us. Are you despised? 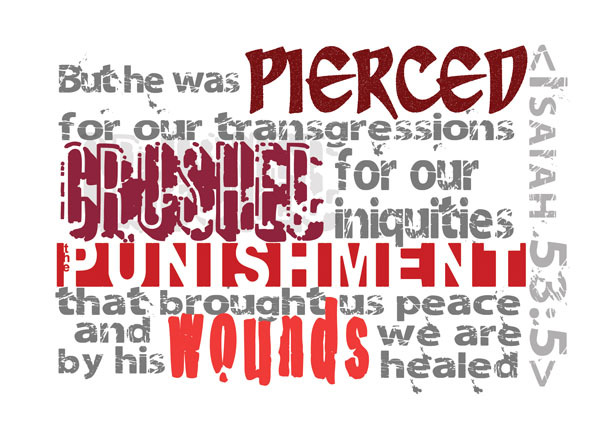 He was despised and rejected of men. Do you cry out that you can’t take any more? He was a man of sorrows and acquainted with grief. Did someone betray you? He was sold out. Are your most tender relationships broken? He loved and He was rejected. Did people turn from you?They hid their faces from Him as if He were a leper. Does He descend into all of our hells? Yes, He does. From the depths of a Nazi death camp, Corrie ten Boom wrote these words: “No matter how deep our darkness, He is deeper still.” Every tear we shed becomes his tear. And then the wise man told me this: it’s not just that God knows and sympathizes with you in your troubles. After all, any close friend can do that. Any close friend can sit beside you and comfort you and empathize with you. No, Jesus is much closer than your closest friend. Because if you’ve put your trust in Him, then He is in you. And, therefore, your sufferings are His sufferings; your sorrow is His sorrow. So when tragedy strikes, as it will; when suffering comes, as it will; when you’re wrestling with pain, as you will – and when you make the choice to run into His arms, here’s what you’re going to discover: you’ll find peace to deal with the present, you’ll find courage to deal with your future, and you’ll find the incredible promise of eternal life in heaven. God doesn’t want you wondering. He doesn’t want you steeped in anxiety over whether you’re headed for heaven. His infallible, inerrant Word says you can know for sure. Don’t rely on the fact that you come to church or you’ve gone through some sort of religious ritual in the past. The Bible is clear that we can be religious but not be in a relationship with God. Religious activities and affiliations never saved anyone. Salvation comes from knowing Christ personally and receiving His provision for YOUR sin and YOUR future. It comes from making him YOUR Savior, by asking Him to forgive YOUR every sin, and by asking Him to lead YOUR life. But it doesn’t happen automatically. It doesn’t come by attending a great church, or being baptized, or taking communion, or hanging out with a bunch of Christians. It comes from deciding in your heart that you want to turn from your sin, to stop trusting in your own resources, and to accept the forgiveness and eternal life that Jesus purchased on the cross and is offering you as a free gift. THAT is how you gain God’s peace and confidence. So settle it now! Resolve this today, at this moment, so that if tragedy were to strike, your eternity with God would be secure. I don’t know all the ways God is going to draw some good from this Aurora situation, but wouldn’t it be something if He were starting right now, with you personally, and using this message to bring you into His kingdom at this very moment? Let the pain of that tragedy open your heart to Christ. Let’s take what was intended for evil and watch God start creating something good from it. Pray with me right now to receive Christ – so that you can know for sure that even if the very worst thing were to happen to you after you leave the auditorium today, it will immediately be followed by the very best thing of all. Lord Jesus, I believe that You are the unique Son of God. I confess to You that I’m a sinner. In repentance and faith, I reach out right now and receive the free gift of forgiveness and eternal life that You graciously purchased on the cross when You died as my substitute to pay for all of my sins. Please, Lord Jesus, lead my life – because from this moment on, I am Yours. I pray this in Your name. Amen.